Our construction cleaning services in Denver, Colorado include both interior and exterior services. Our primary focus is cleaning both the windows and frames, and removing all foreign contaminates from the architectural surfaces. Often, post construction window cleaning requires cleaning each window two to three times, and utilizing a scraper in order to remove window stickers and other difficult to remove objects from the surface of the glass. Our commercial final construction cleaning services in Denver, Colorado are reliable and affordable. Give us a call today for commercial post construction window cleaning prices. You Can Count On Our successful track record for new construction window cleaning services spans several decades. We can provide construction clean up services to meet any timeline or budget. We have provided new construction clean up services for large construction companies, and small construction companies alike. When our clients call on us, they know they are getting construction window cleaning prices that are competitive in the market, and a construction window cleaning service that gets the job done right the first time. Commercial post construction window cleaning in Denver, Colorado is an important part of finishing a construction project. If commercial clean up services are performed incorrectly or insufficiently, stickers and construction debris may be left behind, detracting from the magnificence of the finished product. We know how to go about cleaning glass windows with scrapers in order to avoid scratching the glass surface. Commercial construction clean up services is typically the number one cause of glass scratches on new construction. We have even removed scratches caused by other commercial window cleaning companies during the post construction clean up process. 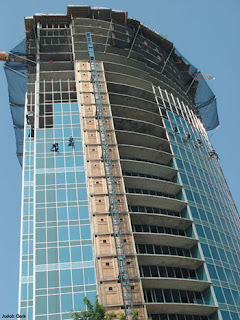 Our professional window washing services are available to handle any type of post construction clean up. Call us today to discuss the ways in which our commercial post construction window washing company can meet and exceed your need.